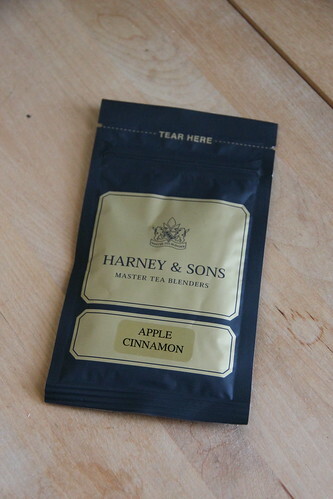 Today I decided to sample the Apple Cinnamon blend from my recent Harney & Sons order. 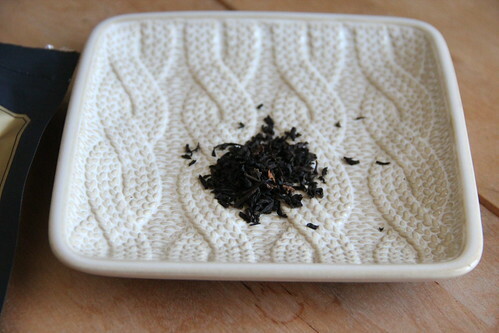 From the website, the blend contains black tea with apple and cinnamon spice. It’s available in a variety of sizes: sample for $2.00, 4oz for $7.50 and 1lb for $21.50. When I first opened the packet I smelled dried apples. Once brewed the tea almost smelled like an apple cider. I didn’t enjoy this as much as a couple of other apple teas I have sampled, but this was a nice black tea with a hint of apples and cinnamon. Mostly, I was disappointed that all the goodness I could smell in the packet didn’t show up in the tea itself. If you’re looking for something that really tastes like apples, this isn’t it. However if you’re looking for a fall blend that’s primarily black tea, then this would be a good choice.